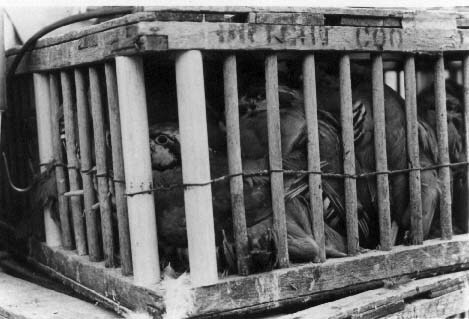 One of the many birds in this crate at a San Francisco live poultry market. On April 15, 1997 the Law Offices of Miller and Miller filed suit in the Superior Court of the State of California, City and County of San Francisco, on behalf of Coalition for Healthy and Humane Business Practices. The suit charges that the following markets are in violation of the California State law which prohibits the keeping of live animals, including birds (1) in any wholesale establishment where food is stored, offered for sale, or sold, or (2) in any business where food is stored or otherwise handled at the retail level: Never Ending Quails, New On Sang Poultry Company, Ming Kee Gamebirds, Inc., Bay Game Birds, Four Seas Supermarket, Hong Kong Market, Lun Sang Market, Inc., Luen Sing Fish Market, Inc., Dragon Market, Sun Duck Market, Wing Hing Seafood Market, Seafood Center #19, and DOES 1 through 100 (i.e. owners and operators of business organizations not yet known but allowing the suit to include them when they have been identified). The suit lists nine Causes of Action against the markets. In addition to the two Causes cited above, the following Causes invoke the markets' violations of designated Health and Safety Codes, Business and Professions Codes, and Penal Codes: (3) using places where animals are kept as a place of storage for fruits, vegetables, and other food; (4) skinning and cleaning of animals in the same room where all of their wholesale and retail business is conducted; (5) killing of birds and other animals in the same room where live birds and other animals are kept; (6) torturing and tormenting of animals; depriving animals of necessary sustenance, drink, and/or shelter; cruelly beating, mutilating, and/or cruelly killing animals or causing such things to be done to animals; subjecting animals to needless suffering, cruelty, and abuse; (7) confining animals in enclosed areas without providing them with an adequate exercise area; (8) maintaining and possessing live chicks, rabbits, ducklings, and/or other fowl for the purpose of sale or display without adequate facilities for supplying them with food, water, and temperature control needed to maintain their health; (9) summary of the above Causes whereby the plaintiff (Coalition for Healthy and Humane Business Practices) seeks to enforce an important right affecting the public interest and as such is entitled to an award of attorney's fees against the defendants (the live animal markets). United Poultry Concerns heartily thanks each and every one of our vigorous members whose donations enabled the Law Offices of Miller and Miller to file this outstanding lawsuit. We thank Baron L. Miller for instituting and pursuing this lawsuit. For continuing progress contact: Baron L Miller, Law Offices of Miller and Miller, Fox Plaza, 1390 Market St. Suite 1204, San Francisco, CA 94102-5306. Ph: 415-522-0500; fax: 0513. Live animal markets epitomize In-Your-Face, I-Don't-Give-A-Damn cruelty to animals. Live birds, turtles, and fish are packed in filthy containers without food or water; frogs are skinned alive; live turtles' shells are ripped off their backs; live birds are stuffed in plastic bags with twist ties. The filth alone constitutes unspeakable cruelty. The birds, fish, turtles, frogs and other animals who are forced to live in the squalor of these markets do not live this way in nature. PROTEST! Order, copy & distribute our brochure "Live Poultry Markets." The issue is not culture but a degrading human tradition, from Ming Lee to KFC, that goes to the root of our humanity and needs to be changed.